Hire a single sit-on-top kayak and enjoy a relaxing paddle around Days Bay. Suitable for kids and adults up to 150kg. Can also be used as a "1+1" if desired, with a small child sitting between an adult's legs. 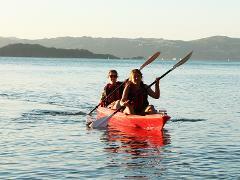 Hire a double sit-on-top kayak and enjoy a relaxing paddle around Days Bay. Suitable for kids and adults up to a combined weight of 250kg, can also be used as a "2+1" for two adults with a small child in the middle.